In the midst of my ongoing search to find places to feature my work, I came across an awesome opportunity from a current member of the Artspace @ Patchogue. If you are not familiar with it, Artspace, is an organization that sets up buildings and provides affordable living and work spaces for artists. They have made it possible for many artists to form and take part in a community of their peers at 35 different locations across the country. Beginning on August 1st, my piece #BLEAH, pictured below, will be hanging alongside many other artists’ work from around the area. The show will run for two weeks, ending on the 15th. My pile of paper. Recently, I felt I had been drawing much less and stalling out. Then I came across this. This mountain that when everything is put together contains 19 sketchbooks of varying sizes and about 1000 sheets (I didn’t actually count the sheets I’m making an educated guestimate based off of the reams I’ve gone thru) of paper. Admittedly, not all of them contain the greatest of pencil scratches or the most dutifully steady ink lines. But they all have something. I didn’t spend time scrutinizing every piece, I don’t ever have that much free time, but I did take a moment to breeze through some of them. Doing so allowed me to see that this enemy pile I’ve been glancing at with a scowl for the last few weeks, is my life. Yep, that’s right. My life laid out in paper: filled with memories, accomplishments, a random bill or receipt here or there, time, beauty, and sometimes terrible moments I would rather crumple up and throw out, but I don’t. A lot of what I am is in that pile and I’ve been letting it sit there, neglected and mostly hated. 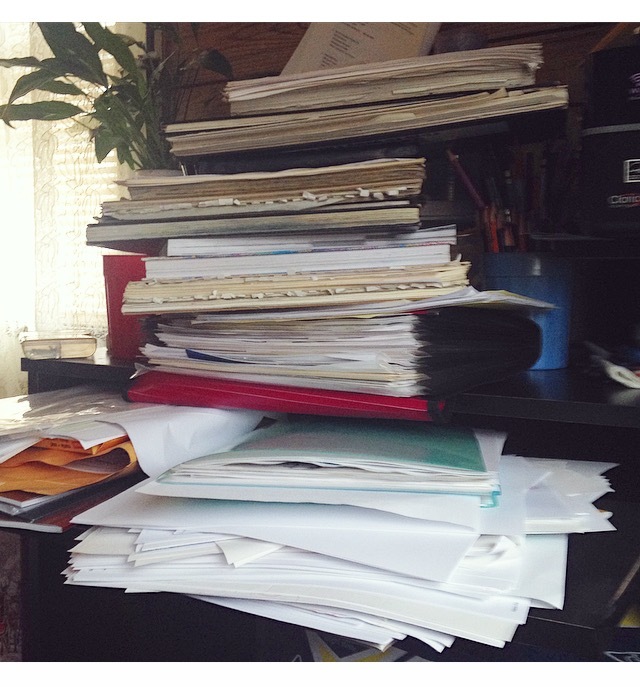 Now, not all the piles in my life are of such importance, but they probably do deserve a bit more positive attention than I have been giving them. This is going to be part of the plan going into 2015 — more attention to and maintenance of me and my piles. The Green Notebook needs an #upgrade. As much as I am a part of and an appreciator of the digital world, as much as I am one of those people with my smartphone constantly at my side, a monitor from a computer never too far from where I am; there’s something about that glow that cannot possibly give me the same satisfaction as taking pen to paper. AND even though I am a big fan of the Evernote App (you should download it right now by the way) I still do not find myself being able to completely hash out my thoughts unless they have been written with an actual pen putting real ink onto a lined notebook page. With that, I believe it may be time to finally retire my green notebook and find myself a new note keeper. For the last few years I have filled this one with thumbnail sketches, accounting notes, business schemes, research, passwords, and notably my attempts at listing all of the states the good ‘ol U. S. of A. contains. ** But tonight I feel I may have filled it, maybe I should move on to a new color even? Get some new sticky tabs to super organize-pimp the new one out. (I am a nerd when it comes to organizing, something that may not always be notable when looking at my desk, but I am). I am now a member of the Society of Children’s Book Writers and Illustrators. Become listed on GoodReads as an author/illustrator — if you are on here be my friend! Haha, I don’t have many yet. And lastly, started up my Author Central account on Amazon to wrangle up all my available titles (even the ones I didn’t write but simply illustrated) This last one is a little bit ahead of the game, because the distribution for my own book hasn’t gone through on here yet. All in good time…. and now I’ll be ready. So yes, all of this entered info, passwords, note taking on the items has now filled my notebook. And now it’s time for a new one, where I will undoubtedly manage to scheme up more goals to accomplish and start knocking them out one by one. **it sounds easy, try to sit down and do it though — these attempts are generally all brought upon by Season 7 Episode 8 of Friends The One Where Chandler Doesn’t Like Dogs, in which Ross tries to do the same and can’t.